Maintaining the looks of a garment is mostly a matter of discipline. Washing too frequently, using hot water and harsh detergents, overheating during drying, excessive exposure to sunlight: all these are to be avoided. One other factor may be the use of a mordant before the first washing. A reagent, such as tannic acid, that fixes dyes to cells, tissues, or textiles or other materials. 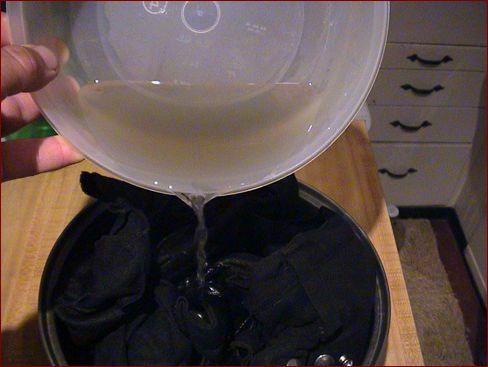 A mordant is a chemical agent which allows a reaction to occur between the dye and fabric. The choice of mordant depends upon the fabric. An alkali mordant, such as soda ash, works well with cottons; an acid mordant, such as vinegar, works well with wool. A solution of vinegar and water will set any color that runs if an acid mordant was used. An acid will not alter colorfastness if an alkali mordant has been used. Since I'm unsure what mordant was used by the manufacturer of the cottons which make up the Utilikilt I'm going on past experiences. On one of my trips to Kaua'i, Hawai'i, I came across the Red Dirt Shirt; cotton tee-shirts stained in the island's red clay soil. The washing instructions suggested soaking the garment in vinegar for a short while before washing. Since I'd seen other people's faded shirts I gave it a try. My two-year-old shirts are still sport the original reddish-brown color. 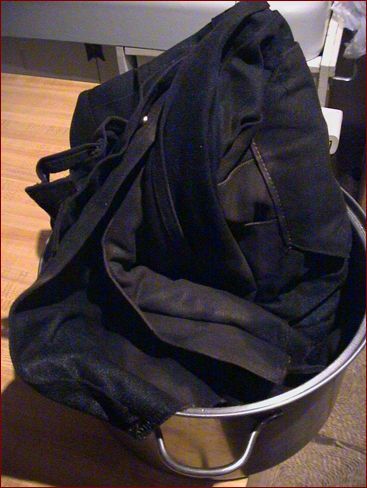 So with that success behind me I give my Utilikilt a bath in vinegar before its first wash. Here you see my chocolate Workman's Utilikilt stuffed into a pasta pot, with two bottles of distilled white vinegar nearby. 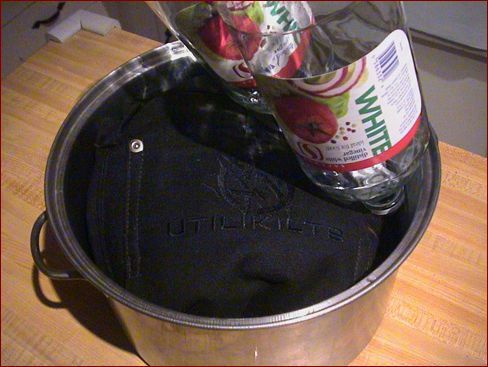 I didn't realize how much material goes into a Utilikilt; next time I use a gallon of vinegar and a five-gallon plastic tub. After taking a few deep breaths, I empty the vinegar onto the fabric. Immediately everything gets much, much darker. And the stench of vinegar permeates the kitchen. Soak, soak. 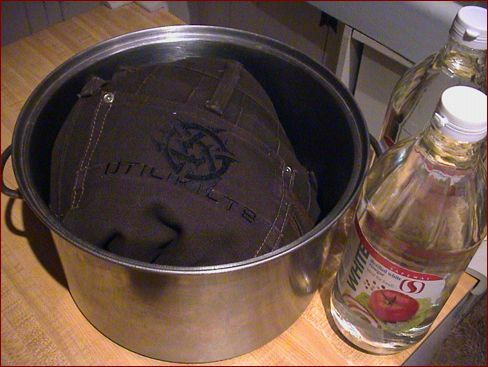 Two quarts of vinegar doesn't soak the entire garment, as you can see here. As I pour the excess back onto the garment I see some of the chocolate colo has bled into the vinegar. I repeat a few times, until I get bored with waiting. Then I pour off the excess, let the rest drip for a bit, and toss the soaking mess into the washer. Cold water, cotton cycle, with gentle detergent. About ten minutes later it's done, and I haul it back upstairs. 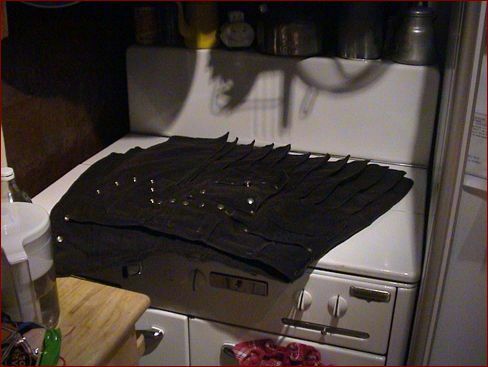 Rather than subjecting the Utilikilt to the stress of a dryer, and since I don't want to shrink it to a smaller size, I'll lie it flat on our ancient covered stove. That way I can snap out the wrinkles, stretch the pleats flat, and let it dry in a gentle, gradual way. It'll be done by morning.